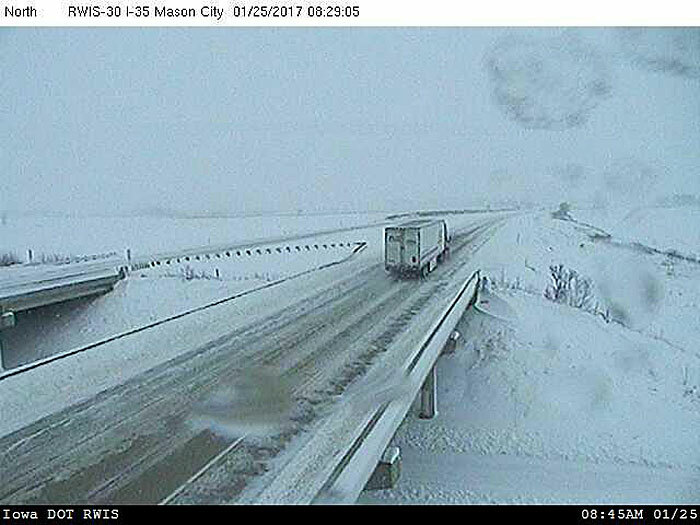 DOT camera showing rest stop near Mason City. 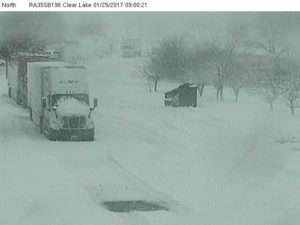 Parts of northwest and north-central Iowa got a foot or more of snow on Tuesday and the flakes are still falling this morning. It’s making driving hazardous across much of the state’s upper half. Iowa Highway Patrol trooper Vince Kurtz says city, county and state snowplow crews have been rolling since late yesterday to clear the thoroughfares. “They’ve been doing a good job of keeping most of our primary roads open,” Kurtz says. “They are mostly-to-completely covered with snow and ice at this point.” Travel is not advised in some areas and Kurtz says if you are on the road, by all means, keep the speed down. “Increase your following distance and we’re going to have a lot of tow trucks pulling cars out of the ditch,” he says. “Move over for those emergency crews and slow down as you approach those.” At least two people died in two separate crashes in northwest Iowa on Tuesday and the winter weather was blamed as a factor in both accidents. The Winter Storm Warning continues for nearly 40 Iowa counties until 6 p.m. Hamilton County engineer Nicole Stinn say county crews had an early morning. Stinn says another problem today will be blowing snow in rural areas with winds expected to reach 25 to 35 miles-an- hour through late this afternoon and tonight. Keep up with the latest forecast at weather-dot-gov and get road condition reports by calling 511.